The most intriguing gossip about Tiger Woods in a new tell-all book by his ex-swing coach is that at the height of his career in 2006-07, the world’s highest-paid athlete seriously considered quitting golf to take up a radically different career. That got me thinking about neighborhood-watch volunteer George Zimmerman. Most people have strong opinions about Woods and Zimmerman, but I want to skip all that to point out an odd similarity between them that I, an old baby boomer, find surprisingly common about youngish men born in the late 20th century. 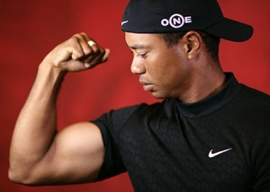 Three years ago in Taki’s Magazine, before all of Tiger’s problems with his now ex-wife surfaced, I pointed out that Woods had become massively more muscular before our eyes in 2006-07. This was puzzling, since looking like a GI Joe action figure isn”t essential to golf. For instance, as a 24-year-old in 2000, Woods had won the US Open at Pebble Beach by a record 15 strokes while wearing a shirt that appeared several sizes too large for his then-wiry frame. With the U.S. Open 18 days away, do you think it was a good idea to go on a Navy SEALs mission? You need to get that whole SEALs thing out of your system and stick to playing Navy SEAL on the video games. I can tell by the way you are talking and acting that you still want to become a Navy SEAL. Man, are you crazy? Woods kept up his strenuous military sojourns well into 2007. Two sources told Haney that Woods’s major knee injury, which pained him so visibly during his last major championship victory, the 2008 US Open in San Diego, was suffered in one of those “kill houses“ familiar from movie training montages where plywood enemies pop up to be shot.